For most of us the firearm sits concealed on our torso, near the waistline. This creates a number of challenges when one walks into a bathroom stall and drops the pants. In this article we will explore the ins and outs of how to deal with this situation safely and tactically. 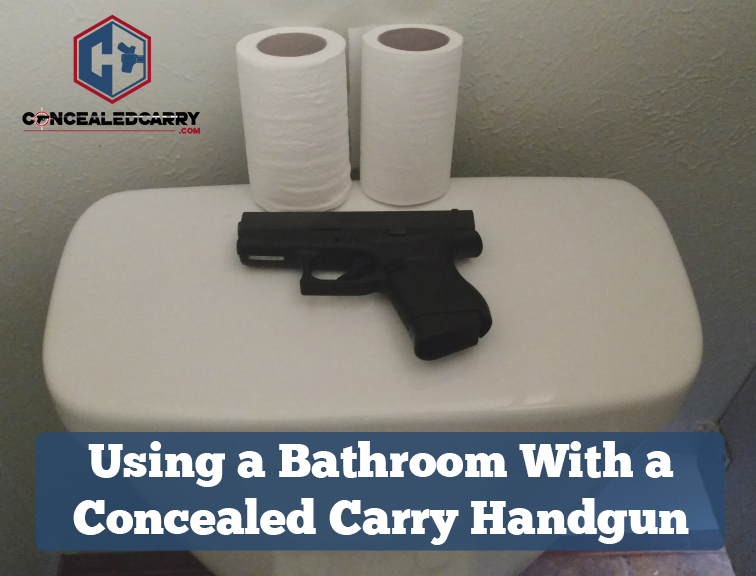 In preparation for this article I trolled the internet and YouTube looking for our industry's best advice on concealed carry guns in bathrooms and I was slightly disappointed. There are some good ideas out there but not enough to fully explore the topic. As you read through the ideas and topics explored in this article consider two key balancing factors. One is accessibility and the other is security. When you carry concealed for self-defense both are important. Accessibility: At no time do we want to become vulnerable. Sitting in a stall is a great point of vulnerability and not being able to retrieve our firearm and fire puts us in a worst situation. Safety: We also need to balance our tactical response readiness with our ability to ensure safety. When you go into a public bathroom move to the farthest away stall. The distance will grant you distance from an incoming threat and it will put you in a position where you only have to worry about threats or prying eyes from one side. Where possible you should look for a family bathroom that has a closed and lockable door. There are also many professionals who remove one leg from the pants before sitting down. This gives you more flexibility should you need to react quickly. With your pants around your ankles your can't move or run but that does take away some of your best options and methods to stow the weapon while seated. DO NOT remove the gun from the holster unless required to respond to a threat. The holster is one of the best tools you have to keeping the firearm safe and the trigger guard covered. Think first to remove the holster from your pants or body before removing the gun from the holster. DO NOT point it in an unsafe direction. It may be difficult to determine a safe direction while sitting on the john but there are some things that clearly are not safe. Don't point it toward yourself or the toilet. Those flimsy stall walls aren't going to stop any bullets either so mind your friend next door. Given what we have covered so far you can intuitively understand how much impact one's holster is going to have on the ease and safety with which one can visit the restroom while armed but use CAUTION. On the list of the most important things to consider when selecting the best holster for you…what will work best in a public bathroom doesn't make the top 25. Unless you spend far more time in the little boys/girls room than I do, you would be better served to select your concealed carry holster based on the other important factors and consider and train to work around it in the stall. Here you see how the Brave Response Holster can be lifted up higher on the torso when sitting down. Waistband IWB Holsters Rock: My go to holster is the Brave Response Holster which secures itself to the body with an elastic waistband. It doesn't connect to the pants in anyway which means visiting the bathroom is as easy as pulling the holster up a little higher on my torso when I drop the pants. This style of holster is by far the easiest solution for gents and gals alike when packing concealed at the bathroom. Ankle / Shoulder / Bra Holsters: Ankle and Shoulder holsters are not as common in our industry but they deserve mentioning here. A shoulder holster or a bra holster makes a trip to the restroom really painless. Ankle holsters don't require any special action to secure or remove the gun but they can become very inaccessible if you are not careful about how you position your pants. If using an ankle holster, when dropping your pants, take a little extra care to make sure that the pants are pushed down below the ankle holster ensuring that you still have access to it. Traditional IWB Holsters: If you use a traditional IWB system that has one or two clips that secure the holster to the belt then you should make a decision about either removing the holster from the pant before taking a seat or when your pants do come down use your legs to keep the waistband rigid so the firearm continues to be secured securely on the belt. 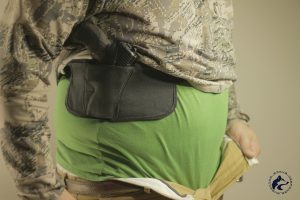 Off Body Carry Systems: If you use a purse, backpack, or other type of off body holster system going to the restroom isn't much of a burden but you should consider how to position that holster such that you can readily draw it if necessary. Pocket Holsters: If you use a pocket holster, leaving the gun in the pocket is going to make it hard to access should you need to draw when the pants are down. We would recommend removing the holster prior to sitting down and securing it in your pants or your lap where you can ensure it is pointed in the safe direction, make it accessible for use, and ensure you aren't going to forget it when you exit. This isn't the article where we expand at length about why you need a good tactical belt but this is one of the reasons on that greater list. If you have your IWB holster secured to your pant with a flimsy belt it is going to flap around and become difficult to secure and manage safely when the pants drop to the ground. A strong and quality belt will remain rigid and keep the firearm safely accessible. I saw some websites that recommend you placing your gun on the floor. Myself, I see that as a security risk. We encourage Concealed Carry for a reason and just hoping that the person in the stall next door won't see or reach for your gun isn't a good plan. Consider in your strategy how you can also avoid drawing attention or giving your neighbor easy access. Don't put it somewhere you can ignore. The back of the toilet or the top of the dispenser are more likely to escape your notice when you stand to exit. In your pants or on your lap … not as much. Be consistent. Creating muscle memory comes down to simple repetition. Do the same thing all the time, and it will become easier to do and remember. Practice at home. For guys–sit down even when you don't need to for a few weeks in order to give yourself increased practice and repetition opportunities. Keep the gun in the holster. In addition to helping keep you safe as mentioned above, the gun is much less likely to be forgotten if it remains in the holster, even if the holster is removed from the body or clothing. What I do (after reading this article I am rethinking my most used response)I carry IWB. When sitting I place my gun in my shorts, it is not holstered but still on my person. However like I said I am rethinking this. My first thought was to leave my gun in its holster and buckling my belt after dropping trow. This would keep the holster upright and the gun in place, I would be at a disadvantage if I needed to use my feet. Maybe a longer belt so I have more leg room at that time. Yes I do wear a gun belt. While is was a Supervisory Special Agent in the early ’90s, one of my young agents went into a stall, dropped the pants and started his business. In the stall on his right, a man who was a) quick thinking, b) a thief, and c) finished with HIS business, reached under the stall, grabbed the weapon out of the holster (standard on the belt holster for the .45) and ran out of the mens room. Agent X was unable to get the door open quick enough to even get a glimpse of him. I was always paranoid after that report, and started hooking my shorts waist band over the weapon to keep it hidden and tight to my leg. Still do that today. If you use a clip-in holster a number of people use heavy beaded neck chains (think the kind they use to make sure the writing pens don’t walk away in banks). It’s not particularly comfortable, but it works in a pinch and if you don’t like pouch holsters, it provides somewhere for you to clip (and draw) on your person. White or black belly band holster solves this problem. $35 for a good one… $15 for a cheap one. First holster was Walmart Blackhawk still feel it’s my most comfortable fit,, but yes pistol never comes out of holster until its time to use, even in storage in a case in holster inside case. Always pull holster with pistol and set it down in holster and then retuck holster with pistol always in holster, unless time to use. I’ll tell you this, there are some thieves who scout bathrooms because many people will hang expensive jackets, purses and maybe a gunbelt on the hook located on the back of the stall door. These thieves simply reach over and grab whatever is on the hook and leave you, literally, with your pants around your ankles and no speedy way to give chase. Remember, criminals/ thieves are lazy cowards. This method, they don’t have to exert themselves nor confront anyone. Before open carry went into effect in Texas on 1/1/16, I carried concealed, IWB. Now I carry openly in a Safariland ALS retention holster. Carry method has not changed my routine. I leave the pistol secure in its holster on my belt and keep my pants just above my knees. Seems to me to be the best trade off for being able to move quickly. I either cradle my kydex IWB holstered pistol in my underwear shorts or place it on the flat toilet paper roll dispenser on my right, if there is one there. It’s in my sightline at all times. Right handed shooter. Jacket pocket is my other option it I keep it on. As a female, I think it can be easier if you carry in a bra holster. But more difficult if you carry on your waist. I have a Sticky, which I love, but obviously this creates a problem. I generally take the holster out of my waist band and put it in the front of my bra to secure it while doing what I need to do. That way it never leaves my body and is still fully accessible. Any other thoughts or suggestions? Catherine, that is exactly what i do. From waist to bra and back. I can’t afford to be seen with a weapon because people around my parts would freak out. It doesn’t just have to be concealed, it has to be indiscernible. I prefer single bathrooms with locking doors as opposed to stalls. Starbucks has a shelf for all your valuables and i use that when i am there. But if you look up, while sitting on the toilet, you can see a 9mm hole in the ceiling where someone got stupid. I use the brave response holsters as well, I have both types and the bathroom is no issue at all. These holsters are extremely versatile and I highly recommend this product. I have upwards of 20 rigs of all types and I can safely say the brave response is by far the best for this issue. Same here, Lonny BRH, both models, NO ISSUES! One of our local police departments had the same issue as described by our FBI colleague. There is now a policy for everybody except uniform patrol guys (who typically remove and secure the whole duty belt). The holster comes off the belt, the pistol and holster go in to the jockey shorts until business is complete and it is time to hoist. I appendix carry iwb on my right side, the bathroom has never been a problem for me. I never drop my pants past my knees which makes it accessible and easy to control. It takes a little practice but it has worked well. As always, a good holster is imperative. K. L. Null SMZ shoulder holster – no issues at all, very fast access if needed. Whether appendix or hip, my firearm NEVER leaves the holster or my belt while in the bathroom. LIke some others have said, keep the belt at or above your knees using your knees to put tension on your pants so they don’t fall down. 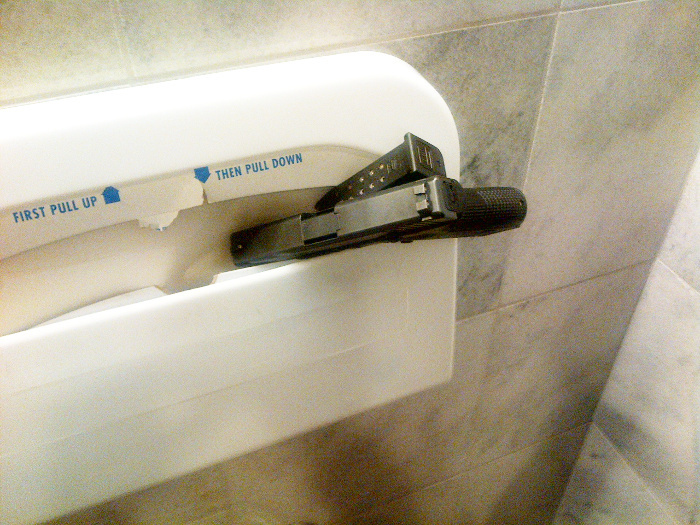 Putting your firearm on a shelf or the paper dispenser is just not a safe practice. Like any firearm skill you need to practice this skill as well until it becomes as easy as your draw. Having carried a gun for 20 years as a police officer and another 17 as a civilian I am paranoid of losing my weapon in the bathroom. (1) I ALWAYS choose stall with a wall on the “carry side” (right). (2) I wear an IWB holster so I remove the gun place it on the floor next to the toilet and within reach. (3) I shield the gun from outside view with my foot. I have many years of experience working with a concealed firearm and have been carrying for over 20 years. As a private citizen now I have carried over what I taught myself when I was with the ‘Feds’ when using a public bathroom as to never leave my firearm in the bathroom. 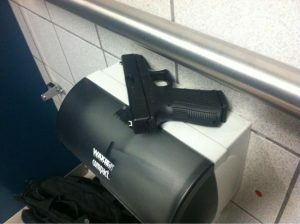 I can tell you stories of all the Federal Law Enforcement officers who have left their duty weapons in a public bathroom. I can tell you stories of Federal Air Marshals who were working undercover on commercial airplanes who have left their duty weapons inside the lavatory of an aircraft only to be found by a passenger. I can tell you of an off duty Air Marshal who left is ‘Fanny Bag” on the hook of the bathroom stall door at a rest stop on the Florida’s turnpike and it was found by a private citizen. Boy do I have some stores to tell. With that said I can tell you what I did when I was working plain clothes as a law enforcement officer and what I do to this day. When I sit down on the porcelain thrown I unholster my weapon and place it directly inside my underwear. This way when I stand up after watching 20 minutes of Youtube videos there is no chance my weapon will be left behind. Its kind of hard to leave it behind because if I forgot the weapon i sure would remember it once I tried to pull up my pants because I would feel a large caliber weapon in my ‘rear’. This is my 2 cents and I have been doing this for 20 years and it has never failed me.